I learned, experientially, two important lessons during last year’s trip that I thought I already knew. It turned out I knew the theory, but I needed some schooling in the practice. Firstly, I learned that more interesting things happen when I give up (the illusion of) control over what happens next. The classic example of this was the day that I ended up jamming with twenty beaming ukulele-playing senior citizens instead of snoozing in a DC hotel room. 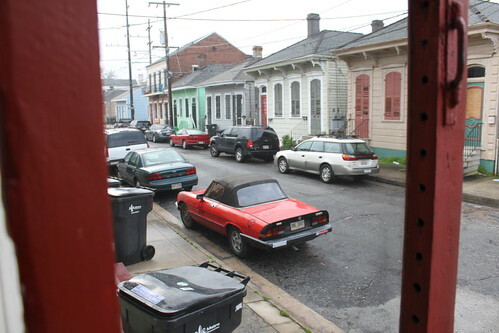 The second is the reason that I have this picture of a small street of shotgun houses in NOLA in my flickr stream. It’s because when I was in New York, 5 days earlier, I blogged that we couldn’t afford to pay for anywhere to stay and we needed help. And in no time Taylor had introduced us to his friend Laura who generously gave us the use of her house for four days, the front step of which I stood on to take that picture. In a couple of weeks I’m going to have the chance to practice them again, except this time I’ve purposefully built them into the structure of the trip. What I’ve also learned is that I don’t necessarily get to be immediately more comfortable with either of them, I just have to keep practicing.